The Jamaica Observer reports that, after stumbling through to the 100m final at the World Championships, Jamaica’s Usain Bolt defended his title in a time of 9.79 seconds (beating the U.S.’s Gatlin) at the IAAF World Championships now under way in Beijing, China. Bolt’s title-defending run silenced his doubters and critics as he convincingly forced Gatlin to battle his way to a second-place finish in 9.80 seconds. 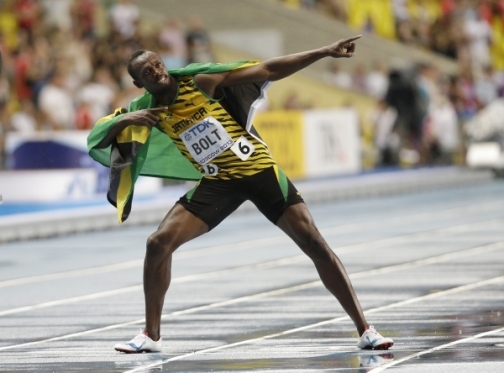 Bolt entered the race as the sixth ranked athlete in the world this year. America’s Trayvon Bromwell and Canada’s Andre De Grasse will share the bronze medal after they both clocked 9.92 seconds. Jamaica’s other finalist, Asafa Powell, finished seventh in a time of 10.00s.